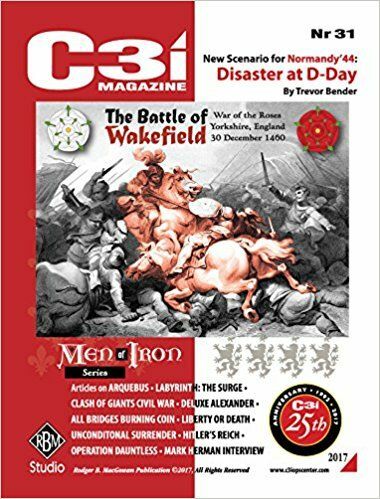 Featuring renowned designer Ralph Shelton's standalone game "The Battle of Wakefield," C3i Issue Nr 31 puts you on the field at the start of the War of the Roses. Can you end the war before it starts, or will England be doomed to a generation of bloodshed? This 25th Anniversary Edition of C3i Nr 31 is also packed full of articles on numerous other hobby games, including a preview of some upcoming COIN Series installments, a new scenario for Normandy '44 presented by Trevor Bender, and errata for C3i Nr 30's acclaimed game "South Pacific." The designer of that game, Mark Herman, also delivers a new installment of Clio's Corner, discussing how Alexander Hamilton inspired the design of Herman's game "Pericles." Steve Carey takes us back to the classic "Clash of Giants Civil War" and Captain Garrett Gatzemeyer gives us some insight into how West Point cadets use boardgames for fun and training. This issue is packed with inserts for many games, including this issue's "Battle of Wakefield," "Empire of the Sun," "Plan Orange," "Blood & Roses," "Corrupedium GBoH," "Liberty or Death," "Wing Leader," "Normandy '44," "Distant Lands," "France '40," and "Ukraine '43." Other goodies include a poster chronicling the evolution of artwork in the boardgaming hobby, and a bonus card for the upcoming game "The Great War Card Game." It was at Wakefield that Richard, Duke of York, met his doom. Richard was head of the Yorkist faction, and had begun the rebellion against King Henry VI that is now known as the War of the Roses. It isn't clear why he rode out that day against an army with numerical superiority, but the end result was calamity for the Yorkist contingent. About half the army perished, including Richard and the Earl of Salisbury (father of Warwick the kingmaker). Can you break the Lancastrian army before its reinforcements arrive or will you share Richard's fate? The Battle of Wakefield is a new, fully self-contatined game in RBM Studio's C3i magazine #31, and is a part of GMT's Men of Iron series, specifically Blood & Roses (2014).